Borla’s EFR Turbocharger Upgrade Kit is a true plug-and-play off-road product. Featuring an EFR ballbearing Turbocharger from BorgWarner, this kit has great power and excellent drivability. The stock turbo charger and tune starts to drop power relatively early in the rpm range, leaving the driver wanting more excitement and power. Borla’s EFR Turbocharger Upgrade Kit extends the power band by 2000 rpm and adds over 100HP. 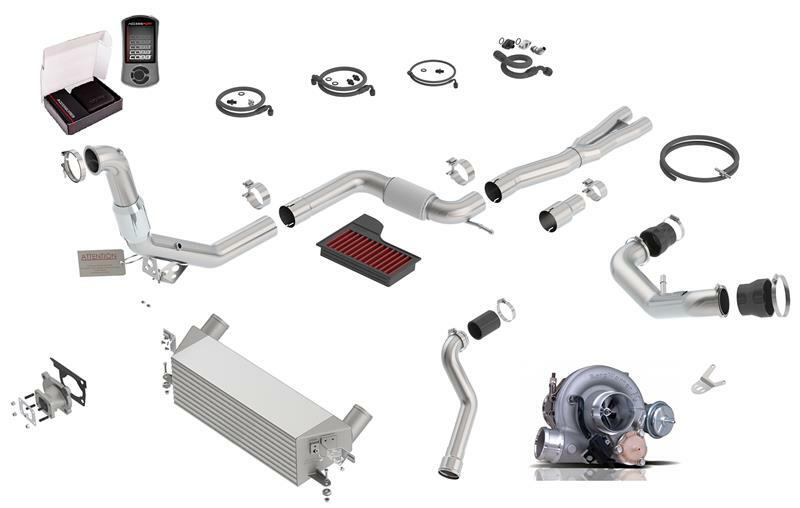 The Upgrade kit includes a large, highly efficient Intercooler. This Intercooler is engineered to provide maximum charge air temperature reduction in the OEM location. Testing has shown the Intercooler to provide significant efficiency gain over the OEM unit, and we typically see charge-air temps 20-25 degrees above ambient. We even found improved performance compared to several front mounted units. A high-flow 3” downpipe fitted with a free flowing catalytic converter is part of the kit, the kit is not certified for street use, but many enthusiasts appreciate the function of the catalytic converter in an off-road only kit. The downpipe is compatible with the OEM exhaust or with the Borla Catback system (not included). However, we recommend the Borla Catback system to reach max power potential, this is because the OEM exhaust is restrictive, a restriction that is particularly noticeable with Borla’s EFR Turbocharger Upgrade Kit installed! Supporting hardware such as the cast stainless steel adapter between the cylinder head and turbo is included as well as water lines, oil lines, silicone hose connectors, vacuum hose, fittings, clamps, nuts and bolts.